A brace of goals to Dimitri Petratos was not enough for Sydney FC to claim an unlikely win against the Central Coast Mariners, a 2-2 scoreline perhaps indicative of the exciting play at Bluetongue Stadium on Sunday afternoon. An again unchanged lineup for Sydney heaped pressure on 3rd placed Central Coast in the first half and it was to be a productive stanza. A Scott Jamieson through-ball in the 17th minute found goal-bound Petratos. Calls for an offside Bruno Cazarine were waived away after it was decided he was not involved in the play. 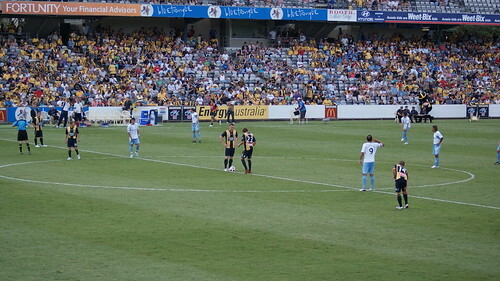 The Mariners defense were consequently left static and Petratos left unchallenged. In the 28th minute a defensive lapse from Patrick Zwaanswjik gave Petratos even more space in front of goal. Zwaanswjik failed to control the ball and was left watching as Petratos slotted home for his second goal of the evening. 2-0 it would stand at half-time. It was a different Mariners side that came out at half time, as is often the case for Graham Arnold’s Mariners. The game opened up just after the restart with a Perez goal from a wonderful Bozanic through ball on 48 minutes. A flurry of chances to both sides followed but in the final minutes it seemed as though Sydney were happy with the draw, defensively substituting Nicky Carle for Sebastian Ryall in the 85th to hang on for a two-all draw. The Mariners pressed for a winner and had all the momentum but were denied on several occasions in front of the 10 546 fans. A gripping three minutes of stoppage time saw both teams have an an opportunity to clinch a winner, McBreen and Jurman each failing on goal. 2-2 it stayed, and Sydney will be disappointed to lose the two goal advantage and drop two points, their season now over. The Mariners will be happy to overtake Adelaide on the table, claiming 2nd place for the remainder of this round at least.